Post-punk and bluegrass rarely go together. Sure, there are outliers like The Punch Brothers or Trampled by Turtles who play traditional instruments at punk-rock speeds, but the two disparate musical styles don’t have much more of a history together. 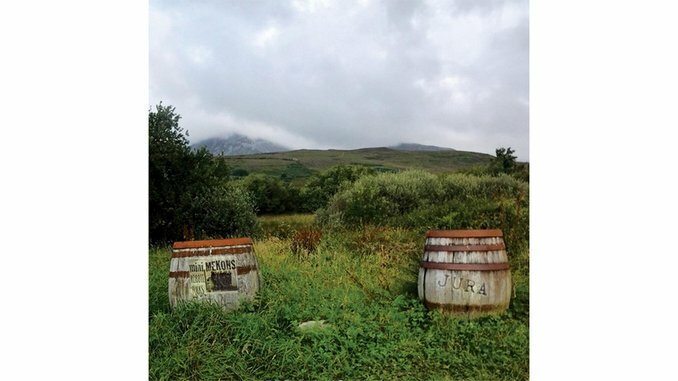 That’s why Jura, a combination between members of England’s Mekons and American folk musician Robbie Fulks, is such an interesting concept album. The Black Friday Record Store Day release, only available on limited edition vinyl and digitally, came together after The Mekons and Fulks toured the United Kingdom together in 2014. Named after (and recorded on) an island off the coast of Scotland, Jura includes songs written by individual members (Fulks composed “Refill” and “I Say, Hang Him!” whereas The Mekons wrote “Beaten and Broken”), originals written together in the spirit of the locale, and interpretations of traditional songs (like the closer “Go From My Window”). The whole LP sounds comparable to a Chieftains album, but showcasing Scotland rather than Ireland. Of course, the history of American folk music reaches back to Anglo song traditions, so Jura’s strengths reside in capturing those sounds and modernizing them. The mini-Mekons play electric saz, violin, accordion and banjolele, and the range of sounds feels both familiar and jarring at once. The number of vocalists contributes to that inconsistency, as well. Within the first three songs, Jura explores melodic balladry from the Mini-Mekons in “A Fearful Moment,” harmonica funk sung by Fulks in “Refill,” and accent-heavy sea shanty “An Incident Off St. Kitt’s.” The discontinuity gives Jura a sense of spontaneity and pays homage to an old musical community, but also makes the album feel more like the one-off, just-for-fun, conceptual project that it is.